Eleven Plus teachers have a much wider influence than solely working with eleven plus candidates. Outside of the eleven plus lesson other people have expectations of the role of the eleven plus teacher. There could be a teacher in a school who hates the whole idea of the eleven plus – and believes passionately that grammar schools should be abolished. Your child, in his or her eleven plus year, could be taught by this teacher. There could be a head teacher who operates his or her whole school on trying to help as many children as possible through the eleven plus. Your child, for example, could be `super’ tutored in the head’s spare time. Outside of the school the eleven plus child’s family must also play a part. Parents could have differing views on the eleven plus – with one `party’ in support and the other in denial. The extended family of uncles, aunts, grand parents and cousins can also play a role in taking an interest in the progress of eleven plus preparations. Then we have the school community. It can lie in the ebb and flow of the school playground. Eleven Plus tutors can be discussed – and accepted or rejected. (One man’s meat is another man’s poison.) A tutor who can be wildly successful with one child may not be as effective with another. A mother chatted to me yesterday. She explained that her older two children had had lessons with us – and that both had passed into the grammar system. She was now entrusting us with her third. I said `Thank you’. She, the little girl, then went on to write a story about a girl who had a red hand bag with a magic potion inside. We enjoyed paragraphs and even direct speech. Many eleven plus boards have given up the idea of an examination in written English having the ability to select children – but her story would leave no one in any doubt that a fertile imagination, a wide vocabulary and the ability to communicate in writing could play a part. Many teachers in Britain work under a national system – with a nation wide salary structure and universal standards of entry. Eleven plus teachers, outside of the system, however, can set their own hours, charge what they like and are largely unregulated. Eleven plus teachers are removed from administrative control. There would also be very little community control of his or her professional activities and leisure pursuits. Perhaps the informal eleven plus `playground’ community could be augmented by a more formal `Eleven Plus Parent Teacher Association’? I had the privilege of being invited into a school sometime ago where there was a sign: “No parent is allowed through this door without permission.” Some Eleven Plus teachers would enjoy a much more relaxed relationship with parents. I remember reading, however, many years ago, a report by Jackson and Marsden (1962) which pointed out that some of the working class parents of grammar school children were rather hesitant to enter the school to discuss their children. The role of parents in the eleven plus saga has not, however, been carefully documented. Yesterday I met another mother who was reading a book and listening to a tape at the same time. She had borrowed the book and tape from the library – and explained that she had come to England some years ago, was still struggling with English, but really wanted her daughter to pass the eleven plus. Hearing this tale of effort and dreams reminds me of a poem I read many years ago. Parents have to make choices about their children – and some choices are not easy. Parents just want the best possible lives for their children. Jou sweet laat op the land. You’ll sweat into the land. “All right dear. I know that you do not have any foreign objects in your eyes. We have checked for this. I know the papers are not too hard. You are getting 85% on them. Your teacher says that you are in the top groups. There are various versions of this well known nursery rhyme. You'll still be the sweetest little baby in town! The valuable eleven plus element is the ability of the song for parents to be able to add their own words. Mama’s gonna give you a massive perk. Papa’s the one you gotta bluff. But please hang on and do not curse. It’s up to you to take your dose. The eleven plus exam is for the birds. My eleven plus humour went down the pan. In the 6th Form, many years ago, we had a short lived craze of the Ouija Board. The word `Ouija’ is to do with receiving mysterious messages. We developed a board by cutting out the letters of the alphabet and placing them in sequence in a semicircle on a table. We then placed an upturned glass in the centre of the table. Each person sitting around the table rested a finger on the glass. The idea was that the glass would move without the benefit of someone controlling the board. Sometimes just one person would place a finger on the glass. Some people were able to make the glass move while others were less successful. On our second adventure someone, I think it was one of the girls, brought along a proper board. This was a flat rectangle made of polished wood. There was general agreement that the glass moved more easily. Like any eighteen year old we were interested in the future. I do not recall questioning the board about how to change or adjust a fan belt. We were also little concerned with how to make pasta. Around half way through the second section, when we were not sure how and why the glass was moving (there was considerable scepticism) my brain called a halt to my involvement. I can still remember the accusations that were levelled at me in the morning about being a spoil sport and an inferior being. The use of an Ouija Board came to mind as I listened to two parents, who do not have lessons with us, talking about the difficulty in finding a suitable tutor who was willing to take their child on in preparation for the eleven plus. We know that the `super tutors’ are acknowledged as having almost supernatural powers. It may be possible for some supremely lucky parents to break into the so called magic circle. Other less fortunate parents, and their offspring, have to settle for what amounts to second best. Is pop corn going to be more nutritious than other fast foods when bribing my child? If my child complains of toothache after every lesson is he or she grinding his or her teeth at the thought of all that extra work – or is there a real problem? Do we really need a super tutor or can a concerted family effort do just as well? A tribe that tries to stop a typhoid epidemic by organising a large scale witch hunt operates on the supposition that witches cause typhoid. When we try to avoid typhoid by inoculations and boiling water we believe we understand that disease is often caused by bacteria and poor hygiene. Eleven plus parents who try to help their child pass the eleven plus by encouraging daily doses of full eleven plus papers may not be helping as much as they hope. What may be happening is that their precious child is just learning over and over again that he or she can not obtain full marks on a paper. Witches usually had a `familiar’ – as in a dog or a cat or even a toad. Witches and witchcraft were put down during the fifteenth century – but this did not stop Shakespeare writing about them in Act 1 of `Macbeth’. When shall we three meet again? In thunder, lightning, or in rain? Common or garden English witches usually practised their rites in February, May, August and November. Sacrifices were made to pagan gods and there was often dancing, excitement and a full range of emotions. As the eleven plus examinations approach this year – in just a few months time - some parents may be advised to warn their children not to take too much notice if they (the parents) suddenly paint their faces green and dance around a foot high pile of eleven plus papers. My child will pass the eleven plus – with our help. But do not put on too much pressure. Nonsense – our child thrives on pressure. Don’t you think that we are overdoing it a bit? It is not long to go now. Can I go and wash my face now? Are reasoning tests just a matter of common sense? Many years ago, before the eleven plus examinations started, Floyd Ruch, a teacher of psychology, gave a test of common sense to large classes of university students. The students were presented with a series of statements and asked to answer “True” or “False”. The marriage of cousins is practically certain to result in children of inferior intelligence. Long slender hands indicate an artistic temperament. Adults sometime become feebleminded from over study. Emotional expression in another person can be judged more accurately from the eyes than from the mouth. If you stare at a person’s back you can make them turn around. This is a form of telepathy. Especially intelligent children are likely to be weak and retarded physically. We can try to apply some similar statements to our present eleven plus children. All eleven plus children should work through lots of papers. The internet has become the most important tool for helping eleven plus children. Eleven plus children need to obtain over 80% on certain `important’ papers – otherwise they will not pass. Parents have to find a famous eleven plus teacher to ensure that their child passes. If you read questions twice you will be able to answer the questions. We hear about the unreliability of markers – and the extraordinary questions that are sometimes set at GCSE and `A’ level. Unreliable marking can appear to cause immense variations in a candidate’s scores. When we come to the English essay, for example, then some questions may ask for imagination and style while others may be looking for descriptive writing. The interpretation of the answer may be subject the marker’s whims, feelings and emotions. Considerable efforts have gone into marker standardisation. A sample of scripts can be sent to a senior examiner who then re-marks – while looking for consistency. Sometimes the marks of two or more examiners are pooled – to try to enhance reliability. Some of us succumb to the exigencies of the National Lottery. Even fewer of us will have had a result worth a few pounds. Our ticket is scanned by an optical mark reader – where a ray of light is passed over our ticket – and this is translated into the winning number. The multiple choice eleven plus tests sat by thousands of children are marked by an optical mark reader. There are eleven plus selection papers on the market where parents and children can practice filling in answers. Some parents use the test-retest model to establish the reliability and accuracy of their child’s practice papers. If their child is able to stand doing the same examination twice, then parents can have a view on progress. Naturally this method relies on not going over the first paper. Memory must play a part on certain questions. Other factors affecting results may the child’s state of mind, external conditions of testing ( for example no T.V. ) and the length of time between the papers. The eleven plus examination, however, in most areas does not allow for a second chance. Would you prefer to have a total rest over the holidays or would you like to do some eleven plus work? Have you been doing enough eleven plus work or do you think that you need to do more? Do you think that your friends are doing the same amount of eleven plus work? Are some doing more? Are some doing less? Does your mind wander sometimes so that you lose track or are you able to keep focused? Do you think that you will get worked up before examination or will you take it all in your stride? Can you sit still for a considerable period of time or do you think that you may fidget in the actual examination? Do you think that you work through eleven plus answers carefully and methodically – or do you tend to answer very quickly? Do you classify yourself as a hard worker? Do you think that you argue quite a bit or are you a bit more laid back? Have you set you heart on passing the eleven plus or do you not really mind where you go to senior school? Do you know anyone who has passed the eleven plus? Have you talked? Does you family prefer you when you have strong opinions or should you think a little more before you engage in a `deep’ discussion? Do you indulge in day dreams? Do you have many interests outside of the eleven plus? Who is better at solving problems? Is your mother better than your father? Are you afraid of thunderstorms? Should you be made to keep your room tidy? Should you ben offered lots of rewards as you do your eleven plus work – or should there just be one big reward - if you pass? Are you pleased and excited by eleven plus work? When parents buy a paper from the internet or from a book shop – or one supplied by the tutor - they are purchasing a paper which is a sample of eleven plus questions. It is a useful sample if it is truly representative. Sometimes, when parents look with great interest at a paper, they may wonder if the paper is a representative sample or a random sample. A random sample of eleven plus questions is a sample drawn from a specified eleven plus population in a random manner. Sometimes random numbers are used to select the questions. In theory, if the population is clearly defined, a random sample should be free of bias. This sample may not be representative of the population – especially if the eleven plus counties or regions have different subgroups of questions. A paper from one publisher, for example, may be very useful for a child in one eleven plus area – but not as useful in another. This does not mean that there is any thing wrong with the test – it simply means that some questions may not be as effective as others. If a paper has been designed and set for the whole country there may be questions that will not come up in your child’s examination. Press on – give help where you can. There is a website you can link up with where it is possible to generate random songs. Type in relevant words about your child, the eleven plus, being clever, working hard – I selected the `Ballard’ option. Wow! This gives you a view of random thoughts! One of the best features of the Eleven Plus examination is the amount of human interaction that is generated. There is interaction within a family, sometimes between the school and parents and at other times, possibly, with an outside agency such as a tutor. How your eleven plus child behaves towards the eleven plus may be coloured by your perception of the eleven plus. Shakespeare, when he was writing `As You Like It’ back in 1600 may have been writing about the eleven plus. Shakespeare does, however, spoil the illusion when a little later on he talks about the school boy creeping unwillingly to school with a shining morning face. Some eleven plus children may find the process of preparing for the examination to be a measured and organised trip – others, however, may feel that their lives are rather chaotic. A `dyad’ is a pair in Greek. The word can be applied to an atom or even an element. In eleven plus terms the word could possibly be used in terms of face to face interaction. The eleven plus parent and the eleven plus child have to adjust their own behaviour in response to the intentions and preferences of the other. When parents are working with their child they have to take into account their child’s emotions and thoughts. Both parties also have to take into account each other’s expectations. “Let us work on this together,” may be music to your child’s ears. I have a friend, Rob Hounsell, who did his final thesis on James Joyce and Ulysses. He was able to understand the stream of consciousness and the apparently rambling sentences. If you take your eleven year old to Dublin you may feel you need to discuss the life and works on one of the world’s most significant authors. Other parents may be off to Paris. I can remember visiting Pont Neuf as a twenty year old – and sleeping in a bush very close to the bridge. Visitors to Paris will often be reminded that the Pont Neuf was the main high way for foot passengers, and a meeting place for down and outs. Charlatans and street beggars used to mingle with the crowds. One charlatan made a fortune selling an ointment from China which enlarged eyes, decreased the size of the mouth and told fanciful horoscopes. The Chief of Police asked for the charlatan to be charged and put into prison. He questioned him. “One hundred,” replied the policeman. To some children working through some eleven plus papers must be a bit like bumbling through seemingly unrelated events – as in Ulysses. At other times parents must wonder if encouraging their child to work through hundreds of questions – in the hope of covering some of the questions that may come up in the eleven plus examination – is either a lost art or a bit of a waste of time. Some eleven plus questions may appear to take rather quaint form. A train 105 m long passes an eleven plus child at 63 km/h in 6 seconds. How fast is a train 100 m long travelling if it passes the candidate in 5 seconds? 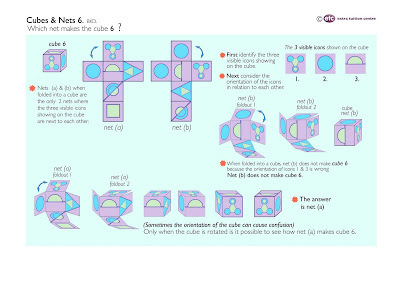 Do you really want your eleven plus child to be able to offer the correct answer, in less than half a minute? Is a question, of this nature, the work of a rambling mathematical brain or the outpourings of an eleven plus charlatan? Or is this a `really useful’ question? What happens when your heart is broken? Does this really mean that you are hopelessly distressed or simply that one day you hope that you will recover? Suppose you tie a goat to a piece of string. Place the goat in a rectangular field. The goat then eats all the grass. Ask your eleven plus child to tell you what shape is the patch of grass that the goat eats? If you then asked your eleven plus child about a piece of string tried to a nail – and you set the question: “If you move the pencil and keep the string tight – what shape will you draw? We can take the experiment a little further. Ask your child a simple eleven plus question. If each side of a hexagon is 6sm long, what is the length of the perimeter? Finally ask your child: If a gardener has enough grass seed to seed a lawn 8 m by 3 m, and he uses it to seed a lawn 6 m long, how wide will it be? To answer these questions your can encourage your child to close his or her eyes and try to visualise the problem. You could also suggest that your child draws a little sketch. This could help to develop a strategy for answering questions. It is difficult to know, however, what to do with the broken heart. All you can do is hope that your child remains happy, healthy and well. If your child does the best that he or she can do then your heart may never be broken. The next time your child argues with you about an eleven plus answer you could relate the tale of Mr. S.E. Asch – who was an American psychologist in the early fifties. He asked a small group of volunteers to match up comparison lines with a standard line. For a while there would be agreement, then all the subjects but one changed their minds and insisted that a line that was obviously shorter was a perfect match. What had happened was that one person was telling the truth and the rest were lying. The lone objector was under pressure to change his mind and move towards agreeing with the majority. A number of the volunteers did doubt their own judgements and agree to change their minds. You explain the whole process again. The head is shaken again – along with a low grumbled mutter. You try again – this time using a different approach – and different examples. Your mind wanders. Is there real comprehension? Does your child really understand what you are saying? Is your child simply trying to shut you up to avoid hearing it all again? Your mind wanders again. You recall a conversation in the playground where one mother was complaining that her son chose his friends from the rougher elements of the class. She told the other mothers that she had asked her son why he played with these rather disreputable characters. He told her that if he played with the boys who did well academically, he would be pilloried and teased. He felt that he should conform. We can see how peer pressure can encourage a child to behave badly or in an inappropriate manner, we can see too how too much repetition can lead a child to agreeing in desperation. All is, however, not lost. Readers of the Telegraph in the early eighties will remember the correspondence in the letters column about the proverb: “Barking dogs never bite.” A canvassing candidate had arrived at a house were an Alsatian was barking ferociously. The candidate was told that she could go in because `barking dogs never bite’. There are many definitions of being a parent. An eleven plus parent, however, may have to acquire skills that are not always needed by the general public. Ordinary parents do not commonly and routinely need to solve verbal or non verbal reasoning problems. A key proportion of ordinary parents are able breeze through a day without having to explain the relationship between lowest terms, ratio and scale. A significant majority of parents, not withstanding the eleven plus, are able to throw up their hands and mutter about a feeling that being a parent, at times, is just being a glorified social worker. Social workers play an essential part in today’s society. Social workers do not only have to work with family and group problems involving poverty and handicaps but their remit is much wider – very often they have to help their clients to come to terms with personal change. Even though there are a myriad of specialist roles within the field of social work the great majority of social workers will have studied behavioural scientists and sociologists. A social worker, however, is not a universal aunt – forced to listen to the problems of other people. Today’s social workers, like most parents, have a remit to help and assist and supply therapeutic comfort when necessary. The case study must surely be the key to learning to understand the problems of others. It may be possible, at times, to see a relationship between a social worker’s ideals and those of an eleven plus parent. The case study is often undertaken to gather information. An eleven plus case study, for example, might include observations on how ready a child is to commence eleven plus work, willingness of parents to listen, observe and participate, the ability of a child, working and living conditions, quality of schooling, relationships with siblings and financial security. It is possible that a social worker may need to include at least some of these areas in a case study. There may be a real problem, however, in that it is too easy to generalise when trying to evaluate the effectiveness of a case study. Many teachers, at one time or another, may have been invited to undertake and evaluate a case study as part of their training to be a teacher. Parents, however, have an inbuilt advantage – they live with their potential case study. They know their eleven plus child backwards – but like all parents they have the ability to be pleasantly surprised by their child’s acumen and ability. The Eleven Plus is looming. What are we are doing to solve the problem? How are you going to solve the problem – if in fact it exists? What do you think the outcomes will be? Success at the end – we hope! Sifting through all the conflicting information, realising that your sweet eleven plus candidate is growing up very fast. Understanding that you can not hold back change. What are you going to do between now and the examination? Will you do it all again? Well we may have to – because number two is only a few months away from starting. Long before any eleven plus parent sets off to engage in a dialogue with an eleven plus professional there is little doubt that many discussions and conversations will have taken place. Only a small element of the worries and concerns of many parents will ever be offered – because most concerns will be submerged. Very often family, friends and relatives will be consulted – and sometimes listened to. The professional help is often sought to confirm a diagnosis. The professional’s conclusions are then relayed to the family who listen and then advise action. Sometimes a decision is made then and there – but a moment of reflection is often the most effective remedy. Parents will have a very different perspective on their children to that of teachers, tutors and consultants. Very few parents would argue that an outsider knew more about their child. What makes a parent on a particular day to consider engaging the help of an outsider? A child may have been experiencing pre eleven plus problems for some time. Some parents will have played bringing their children up by a common sense set of rules. There will have been regular visits to dentists, opticians and possibly even doctors. There are the parents who may possibly have been present at open days at school, parent meetings, school plays and fetes. Some parents may even be able to say that they monitored their child’s homework rigorously – and were always available to give eleven plus help and advice. When I was growing up our family doctor always used to say: “What makes you think you have a problem?” We were then expected to be able to diagnose out own symptoms – and even suggest some conclusions. In hind sight he may have worked on the premise that he felt that many illnesses were psychosomatic. No doubt our Latin teachers at school would have used the words: “Cura te ipsum.” This urges us to cure our selves before trying to treat others. Ask your child to read the question again before asking for help. Remind your child that he or she may have met a similar question previously. Suggest to your child that he or she does not `get stuck’ on one question but moves on and then may choose to come back to that question later on. Remind your child that you will not have a physical presence in the examination – but you will be there in spirit. Ask your child if he or she really needs outside help or whether most of the eleven plus problems can be solved with the family circle. What do some parents want from their eleven plus teacher or tutor? The teacher should be able to successfully guide the development of the eleven plus child. Parents would also hope that the teacher will be able to understand their child’s behaviour. It should not be difficult to think that children should also play a significant part in the eleven plus process – after all it is the children who have to do most of the work. Does the child understand the teacher’s behaviour? Eleven plus teachers need quite a bit of information about the children they are teaching. Is the child feeling well? Are there holidays approaching? Has the child done any work outside of the lessons? Very few parents would want to argue with the premise that the more information that can be offered the more likely it is that the correct lesson can be prescribed. Some teachers seem to be able to sum up a child in a remarkably short time. The playground feeling may be that a teacher of this genre is born not made. Some parents would probably rush to have their child tutored by a sympathetic and knowledgeable teacher. It is very likely that the best possible eleven plus teacher, or tutor, is going to be either the mother or the father – or a combination of both parents! 1. Mums and Dads know their children. 2. Mums and Dads can change the rules because they are the mums and dads. 3. Children are usually pretty astute – and know their parents’ moods. 4. Mums and Dads know about holidays, health and the amount of work that has been done. 5. Mums and Dads can be remarkably sympathetic at times. It does not matter if parents can not work out all the answers. One bright little eleven plus boy explained to me today that he was doing very well on papers at home but that his mother found some of the verbal reasoning questions hard. I asked him how he coped. He replied that he did not mind as his aunt was a teacher and he could ask her! Should you allow your child to become stressed about the eleven plus? Are you sure that you should reiterate that: “It does not really matter.” Do you always try to smooth things over for your child and do your best to help your child avoid reality? Does your child deliberately look for stress? Have there been signs of this from the beginning? Was your young child passive and inclined to sit sucking a thumb or was he or she active and enquiring? Does your child worry about `getting into trouble’ if he or she does not achieve good marks on a paper? In adults we accept that stress is to be expected when moving house. Losing a job, losing money, losing friends and feeling a loser are all acceptable triggers for stress in adults. Job interviews, driving tests and mislaying car and house keys can all contribute to feeling stressed. We are told that exercise helps. We are reminded that a counsellor can possibly help. Some adults try hypnotism and others suffer a diet of pins being stuck into key parts of the boy. Some possibly read the stars so see how they must react. Others may rely on their biorhythms. How can you help your child? In theory your child may need good sleep patterns. We are told that 8 hours a day is needed. But what can you do if your bright, able and articulate child does not feel the need to sleep for eight hours a day? Encourage your child to take breaks. What can you do if the five minute break turns into a fifteen minute argument about when to return to studies? Ask your child to turn from `I can’t’ to `I can’. Help your child to manage his or her time. Timetables, lists and action plans are all supposed to help – but not all children react well to being organised. You may have to play it by ear. These two are possibly the vital ingredients in holding down stress levels. This is a worked example from Statistics 1 – Advancing Maths for AQA (Heinemann) 2000. ISBN 0-435-51312-5. A tasting panel was asked to assess biscuits baked from a new recipe. Each member was asked to assign a score from 0 – 100 for texture (X) ,flavour (Y) and sweetness (Z). Draw a scatter diagram to illustrate the data. Your eleven plus child, with the aid of some graph paper, should be able to make sense of this data. Your child may also be able to make deductions and comment on the spread of the data. The second part of the question asked for the product moment correlation to be calculated. This, however, may be beyond the scope of a traditional eleven plus syllabus! Reassure your child that the work that is being done towards the eleven plus will have value one day. If only the eleven plus could be changed so that it was a little more universally attractive to more children. Some children feel that they are just not ready to take on the challenge of the eleven plus. Other children know that they are able to take the examination – but determine that they are neither ready nor willing – and so opt out. Other children do not want to take part unless a guarantee can be offered that any extra work will result in a pass. It would be wonderful if our children could feel that the eleven plus was the very essence of education for the bright and the deserving? Imagine if more of our eleven plus children could feel that working towards a competitive examination was an innate gift. Suppose we set out to establish that the eleven plus was the very essence of education. It would be fun to try to make our children excited about the eleven plus and the rather broader education it has the potential to offer. This could save a lot of slogging through countless eleven plus questions and papers. If we could reach a state of confidence - untrammelled by urgency and anxiety – we would find little reason not to be pleased with ourselves. Rudyard Kipling gave us `If’. The link through to `poemhunter.com’ offers the whole poem – but the comments that follow are almost equally illuminating. There will always be countless shades of opinion on the eleven plus. The end of term is approaching – and with it the holidays. Eleven plus children all over the country will be hoping that their parents do not get too carried away by the idea of even more extra work over the holidays. One or two children may even have been able to tempt their parents with the idea of an eleven plus party. To play this game the host and hostess should prepare a list of eleven plus questions. Divide the children into two teams – and encourage them to sit together at opposite ends of the room. The party then needs an affable quiz master or mistress. The quiz master (or mistress) then places himself (or herself) near to the rum punch and tops up the waiting glass. One player from each team is then sent to collect an eleven plus question. The rest of the team have to either guess, or work out, the answer. Only the words `Yes!” or “No!” are allowed. One a team has correctly guessed the answer the next player is sent out to collect the next question. Teams have to be reasonably quiet so that they do not give away the answer to the other team. The winning team is the first team to guess, or work out, all the answers to the questions. Naturally this game will have to have forfeits. How about the losing team having to read a chapter of a book? What about doing an eleven plus paper? The children themselves may be able to think of suitable forfeits. Enjoy the ride! This is a plea to all mothers of eleven plus children. Do you remember the day your husband to be whispered sweet words in your ear? Do you remember him reading Lord Byron to you? Do you remember your reaction? Do you remember the words he spoke? High sat white Helen, lonely and serene. He had not remembered that she was so fair. The perfect Knight before the perfect Queen. Do you remember the pride you felt the first time your child answered an eleven plus question? Do remember sharing the excitement with all your family and friends? Do you remember looking for more and more and more papers to feed the voracious mind? Do you remember how happy you felt when your child first achieved over 90% on a paper? My child kissed my hand, and completed yet more work. The perfect candidate before the perfect Mother. Got shrill as he grew deafer. And both were old." At least your eleven plus will be over before you grow shrill! Long ago, well before the birth of the eleven plus, an esteemed pioneer in `scientific management’ called Frederick W. Taylor found that efficient work methods stepped up productivity. The average amount of pig iron a man could load on a car 12.5 tons a day. He showed the workmen how to move, how to bend, when to rest – and some men increased their output to 47.5 tons a day. All the men increased their output considerably. Move onto stage two. Now this is not advocating large families but do you remember Frank and Lillian Gilbreth? (Twelve Children! )They analysed many jobs into elemental operations. Motions were checked and the time taken for each movement was analysed to see where efficiency could be improved. They made hundreds of time and motion studies and discovered several new principles. Both arms should move simultaneously – and in opposite symmetrical directions. Continuous curved motions are better than jerky movements. Foot pedals should relieve hands when ever possible. Tools should be conveniently placed. Hug your child with both arms simultaneously. A one arm hug, on your part, smacks of indolence. Try to keep cool and calm when working on an eleven plus topic – too much emotion can take the pleasure out of a shared task. Do not be tempted to give you child a quick boot – the laying on of hands is probably more effective. Make sure that all pens, pencils, dictionaries, papers, books, food, ice cream, bribes, computers and a variety of drinks are available before your child starts work Trips to the bath room, to look for the cat and then feed the budgie should be conducted, when possible, prior to engagement. Television sets, siblings and mobile phones should be placed in a sound proofed room – well away from the scene of battle. Offer all `Eleven Plus Time and Motion Advice’ forcefully when necessary – but in a kind and sympathetic manner. Above all – remember that rest periods should be a complete break from eleven plus activities. Parents contemplating the approaching holidays – and thinking of buying extra books and papers to take on the trip to New York to the cousins, or on the three week Mediterranean cruise should think again. When your child cries: Oh! Give me a break Mum,” think about your child’s needs – not the eleven plus. A person who is a Latin dancer would be able to pay close attention to a couple dancing the Merengue. In the Merengue the two dances try to mirror each other through a series of sequences. On the first beat the man shifts his weight to the right, the woman to the left. The woman’s right leg and the man’s left leg then bend at the knee as the weight is released. On the second beat the weight is shifted across to the other foot. There is often a pronounced movement of the hips. Would a non dancer note the movement of the hips? Of course – if the movement was accentuated. A deaf person may be able to play attention to loud noises – but may not be able to hear or react to softer noises. A deaf child may hear some sounds – but however hard the child tries to pay attention he or she may be hearing little sound or even distorted sounds. Rudyard Kipling described Kim’s Game in the Jungle Books. Articles are placed on a tray and are covered over. The cover is then removed for a few seconds while an attempt is made to remember as many objects as possible on the tray. This exercise is good fun – and it also attempts point out the need to pay close attention. William Stanley Jevons (1835–82), threw beans into a box and then estimated the number. When he was paying attention he found he could easily count three or four beans. He sometimes made mistakes on five beans. When he threw ten beans he was right about half the time. He was almost always wrong with fifteen. (You could try this at home!) The American psychologist George Miller cited Jevons’s work when he was working on chunking. The idea behind chunking is that numbers can be recognised more easily if they are grouped. In KS2 mathematics we can use chunking to do division. This form of chunking is achieved by repeated multiplication. Is it likely that enlightened teachers teach chunking to help their children focus and pay attention? Attention can be selective. An eleven plus child can choose to be attentive. Parent can, however, help their child with developing an attention span. Try a little dance. Try a range of sounds. Try Kim’s Game. Throw beans around. Keep working at chunking until your child has grasped the concept. If ever we wished for a peaceful transition from a bright laid back child to a hardworking and serious scholar we may wish to look at a view of R. D. Laing in his works on `Knots’. If we are to expect our eleven plus children to change dramatically, and suddenly become eager little students, we may find that they need to work through many layers of uncertainty, opposition and even possibly fear of the future. Yet children do change over the eleven plus year. Therefore, I pretend I know everything. At this stage some parents may feel a slight twinge of irritation. What happens if your child meets a knotty problem in the examination? Will he or she read the question again or just guess at the answer? Do parents have the right to keep on nagging in the hope that they can change the habits of lifetime – or do they accept that sometimes it is not humanly possible? Is it really worth the time and effort or can a mother or father feel confident that their child may make the odd mistake but will generally `pull through’? T.S. Elliot (1939) had a lot more faith in people and their ability to understand the need for change. And the curse be ended. Perhaps, after all you are needlessly worrying, your child will unravel the knots.